Craigslist Automated Classified Ad Posting and Submission Software! It enables you to post your ads to CraigslistTM* Quickly and Easily! This New Software will enable you to cut ad posting to just a few seconds! FREE Trial! Craigslist Classified Ad Poster Craigslist Automated Classified Ad Posting and Submission Software! This Powerful New Software Quickly Enables you to post your ads to CraigslistTM* Quickly and Easily! This New Software will enable you to cut the time ad posting takes to just a few seconds! 100% fully automated, with the exception of captcha verifcation image codes. This unique program does everything you can normally do manually, Only FASTER!-- Much Much Faster! Software Features: Rotating subject, email, & Body Functions. Ability to add random text of your own choosing, to every single input aspect. Allows you to go 'Stealth' by supporting Internet Explorer browser proxies. Gmail Enabled. (will check your mail and confirm your account post) Private Mail Enabled. (will check your mail and confirm your account post) Allows you to quickly visit the pages/Advertisements that you have generated on craigslist site. Allows you to go 'Stealth' by supporting Internet Explorer browser proxies. This unique program does everything you can normally do manually, Only FASTER!-- Much Much Faster! Software Features: Rotating subject, email, & Body Functions. Ability to add random text of your own choosing, to every single input aspect. Allows you to go 'Stealth' by supporting Internet Explorer browser proxies. Gmail Enabled. (will check your mail and confirm your account post) Private Mail Enabled. (will check your mail and confirm your account post) Allows you to quickly visit the pages/Advertisements that you have generated on craigslist site. Advanced human emulation functions. 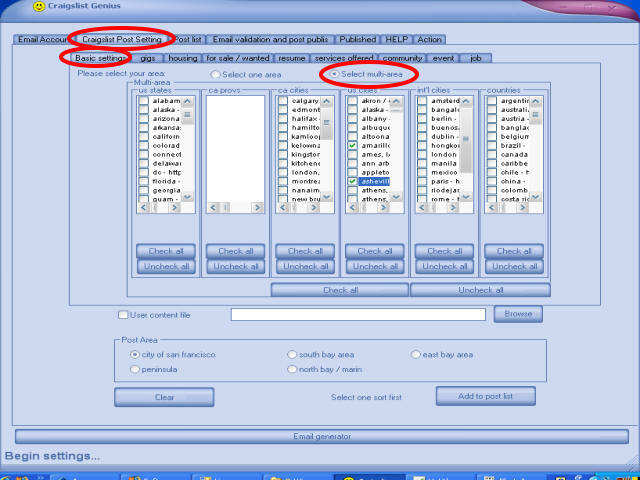 Yahoo Pal - Yahoo Pal is an add-on program for the popular IM software Yahoo! Messenger. AutoFTP Premium - Its primary usage is transferring files between local and remote computers. MailCOPA - MailCOPA, simply the best email software available. 123 Flash Chat Server - 123 Flash Chat server software is full-featured & high-performance chat server plus stunning Flash chat client! LAN Chat Enterprise - the system of instant messaging and transmissions of files for office, firm, educational institution.